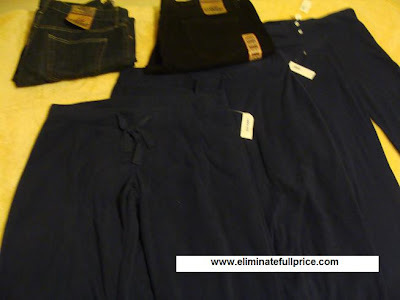 Eliminate Full Price: Black Friday: Saved $10.73 @ Old Navy, got $33.97 worth of items free @ Target, free pants @ Sears, & $39.01 off a $59 top @ Macy's! Black Friday: Saved $10.73 @ Old Navy, got $33.97 worth of items free @ Target, free pants @ Sears, & $39.01 off a $59 top @ Macy's! This year's Black Friday was the first one where I actually had specific goals in mind. With previous Black Friday's I would simply go to mall with my mom about 10 minutes before it would open and then look around to see if there's any cute clothes to buy. I began my Black Friday adventure at Old Navy since they opened at midnight. I went with my dad because my mom didn't want to go out in the cold weather. I was hoping to get a wristband for the free xBox 360 Dance Central Kinect game with a $25 or more purchase. At around 11:40 PM I got to Old Navy and the line was already long so I wasn't able to get a game. I went inside the store despite not getting a wristband. I wanted to find some new tops and check out their leggings. A lot of shoppers were grabbing clothes left and right. I was a bit disappointed at the low selection of tops at Old Navy. Most of their stock was pajama pants, sweaters, and jackets which I understand because it's almost winter. Also, their sizing was a bit odd. I tried on tops in my size but they were tight in the abdomen area so I tried on the next size up and it was too big. I ended up getting 2 pajama pants and 2 thermal pants. One thermal pant will go to my mom because she asked for it. The pajama pants and thermal pants were $5 each. Then my dad got 2 straight leg jeans for $15 each. I had a $10 off a $50 purchase I got from Old Navy's Facebook page. The total before the coupon and with 9.25% CA tax was $54.63. After Old Navy, the next store I wanted to visit was Target which opened at 4:00 AM. 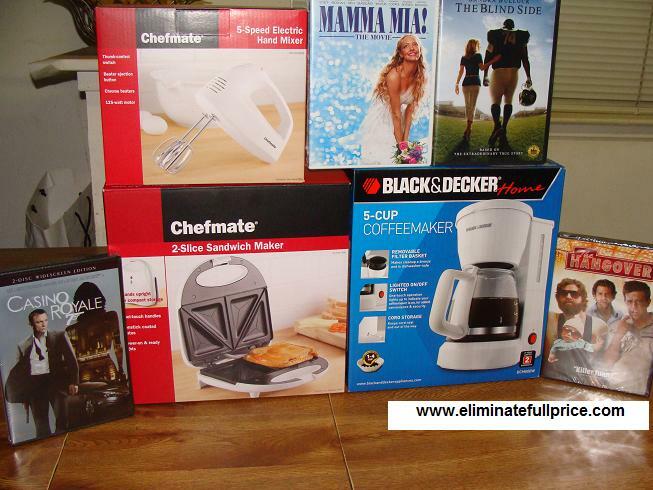 In Target's Black Friday ad, I saw they had sandwich makers, hand mixers, and toasters for $3 each. Getting the sandwich maker and hand mixer was my main goal of Black Friday. I also thought of getting the toaster too. Another goal of mine was getting the Blind Side on DVD for $3.99 and Mamma Mia for $3.99. I considered getting Casino Royale for $1.99 and The Hangover for $5.99. When my dad and I arrived at Target, we saw a long line wrapped around the side. We got in line around 2:50AM. My face was freezing as we stood outside. Plus this Target was near the freeway so the cars speeding by would cause cold air to blow toward us. About 10 minutes before Target opened, a few Target security guards handed out maps, and an updated information sheet with a list of items on sale and their exact location. This sheet of paper was very useful because the map said some items would be in a specific location but the information sheet had the updated location. I told my dad that I wanted to get the sandwich maker and hand mixer first on the second floor near the escalator. Then we'd go down to the first floor and get the DVDs. When the doors opened it was a frenzy. There were people trying to get big flat screen TVs. I grabbed a basket and then me and my dad power walked to the escalator area. I see a lot of merchandise around the escalator but no sandwich makers, hand mixers, and toasters. I walked past the escalator and noticed that there weren't many people in the direction I was going. I had a feeling I wasn't going the right way for the sandwich makers and hand mixers. I started to panic and I was about to see if I could find an employee to help me find the items I wanted. I turned around and started to walk back toward the direction I came from. That's when I saw a small stack of sandwich makers and hand mixers along the side of the escalator. I weaved through the people who were pushing their carts with TVs and got 1 sandwich maker and 1 hand mixer. I was so relieved. They were next to a stack of coffee makers so my dad asked me what about a coffee maker? I saw they were $8.99 so I figured why not get one. My dad had been talking about getting a coffee maker for like the past 5 Black Fridays but he never got one so I decided it was about time he get one. After about one minute, when I looked at the space where the sandwich makers and hand makers were there were no more sandwich makers and only one hand mixer left which eventually got snatched up. I thought if I hadn't turned around and followed my instinct that I was walking in the wrong direction, I wouldn't have been able to get those two items. Then we went to the first floor to find the DVDs I wanted. I was able to find Casino Royale for $1.99, Mamma Mia for $3.99, and The Hangover for $5.99. I couldn't find the Blind Side anywhere. That was the movie I wanted the most because I love it so much. I scanned each DVD aisle but didn't see it. My dad and I then stand in line to check out. Since this Target was at a General Growth Properties (GGP) Mall, I was able to use some GGP gift cards that I got for free for being part of the GGP e-mail list. I had $46.62 total in GGP gift cards that were given to me for free. My total for my Target Transaction was $29.59 but since I used my GGP gift cards everything ended up being free. I know you're probably thinking why in my picture you see the Blind Side DVD when I mentioned I couldn't find it. Here's how I ended up finding it. After Target, my dad and I went to JCPenney. I wanted to see if they were still giving away free snow globes. Unfortunately there were no more snow globes by the time we got there. I decided to look for some clothes. I spent almost an hour finding and trying on clothes but nothing seemed to fit me right. I felt bad that my dad was carrying around the items we got at Target so I suggested we put them in the car and then continue shopping. Since the car was parked near Target, we go back and as I get on the escalator that's when I saw along the side of the escalator there was a huge display of the DVDs they had for sale. I told my dad I wanted to see if that display had the Blind Side. So after my dad and I put the items in our car, I went back to that display and that's when I found the Blind Side DVD! I was glad I found it because that's the DVD I wanted the most. Once again we get in another long line. The movie is $4.38 with tax but it's free since I used the GGP gift card I had. My first Target Transaction was $29.59 + My second Target Transaction was $4.38 = $33.97 total but all free with my GGP Gift Cards! The next store I wanted to go to was Sears. My dad decided to sit at a bench and rest while I looked around. The selection at Sears wasn't that great. I tried on a lot of clothes but they didn't fit right and the quality of the clothes wasn't good. 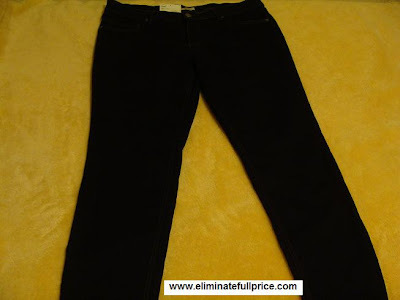 I did find a pair of black pants that felt comfortable. The pants were $9.99 and with 9.25% CA tax added the total was $10.96. I had a $10 Sears gift card I won from My Coke Rewards plus the GGP gift card to cover the remaining $0.96. The pants ended up being free for me! By the time I was done at Sears, the sun was already out. I couldn't believe I had been up all night. My feet were hurting so bad but I wanted to go to GAP and Macy's. When I got to GAP there was a long line and it was a complete mess inside. The clothes were all picked over. I tried some tops but I didn't like how the looked on me. I almost didn't want to go to Macy's but it was close to GAP so I went. I didn't have any luck finding tops at Old Navy, JCPenney, Sears, and Gap so I hoped Macy's would have a better selection than all of those stores. I browsed around Macy's and tried on 3 tops. I tried on a blue ECI top and it fit perfectly! It was exactly the type of style and fit I'd been searching all morning for. I tried on the ECI same top in black but I felt like I was dressing for a funeral so I decided not to get it. Then I tried a gray long sleeve Alfani top and it fit me perfectly! It wasn't too tight and too loose. 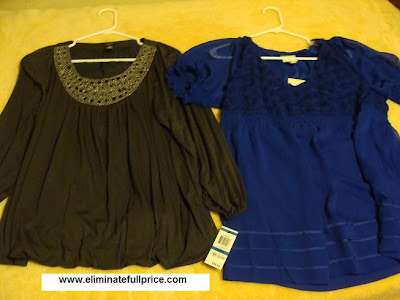 The price tag of the blue ECI top said $59.00 and the price tag of the gray long sleeve Alfani top also said $59.00. I went over to the price check machine and scanned the price tags. The blue ECI top rang up $19.99 which made me happy. The gray Alfani top rang up full price at $59.00. I was glad I finally found a top that I loved but I was bummed that there wasn't any discount on it. After a debate with myself on whether or not to get the gray Alfani top, I decided to get it. I had failed at finding a top at Old Navy, JCPenney, Sears, and Gap because nothing fit and looked good on me. Now that I've found something at Macy's I couldn't bring myself to let it go. I was hoping to use a $10 off a $25 purchase and my GGP gift cards at Macy's but unfortunately, the coupon didn't work on the tops I got and for some reason the register wouldn't accept my GGP gift cards. It hurt a little not being able to get an additional discount at Macy's but I thought the great discounts I got at Old Navy, Target, and Sears more than made up for that. My total spent at Macy's was $86.69. It was the only time on Black Friday I actually used my money to buy something. After Macy's my dad was completely exhausted. He wanted to go home and rest. I wanted to rest too so that was the conclusion of our Black Friday adventure. By the time we left the mall it was around 9:15 AM. We had left the house at around 11:30 PM Thursday. We had spent almost 10 hours waiting in line and shopping around. My feet are throbbing but I felt it was worth it to go out. I'm happy I got to use a couple of gift cards I've been holding on some great things that I need. Did you go out and shop on Black Friday? Feel free to share your stories with me.